The Web often has a flavor of the month. Some stick around, others fall by the wayside. The latest biggie is visual sharing website Pinterest which has proven to be a geek gals BFF. While female dominated (there are some guys versions, my favorite being gentlemint.com) adoption of the system has been significant and as always, it’s important as Internet Marketers that we explore if there is value to our clients. Often one of the first things we look at is SEO benefit. We know that back links are a valuable commodity and initially Pinterest offered great value. Recently however, they adjusted their backlinks to be nofollow which means that the links do not give significant SEO benefit (I personally think there is still value to nofollow incoming links) so if we are thinking about using the system solely to build links, we’d be wasting our time. Next thing we look at is Pinterests own Search visibility. While I’ve personally seen it appear in search results, it doesn’t seem to have the same impact that linkedin or facebook has but for a new player, there is some strong evidence to support its own search visibility. So according to SEM Rush their Search visibility is off the charts. 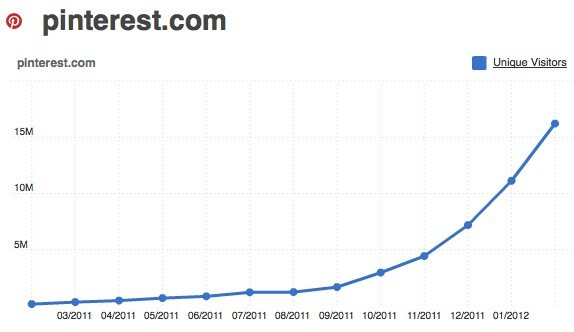 No surprises of course with some 800K results in the Top 2 pages and significant growth from the end of last year. Now what sort of results are we seeing? Being the Minnie Mouse fan that I am, I’m in desperate need of some party suggestions. And according to Google’s keyword tool, a lot of other people are as well. 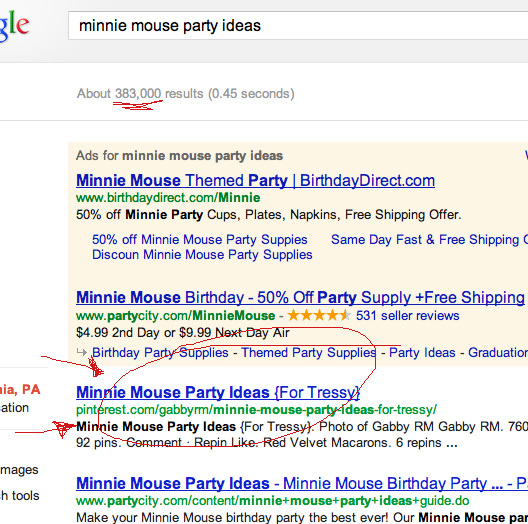 “Minnie Mouse Party Ideas” has some 8100 estimated searches per month. Have a look a the #1 spot! Given that we know the demographics definitely skew female and that it’s a very visual/artsy community, the site lends itself well to businesses who cover at least one of these elements. 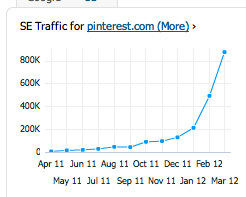 For some, Pinterest is already proving to be a solid referral source. For SEO benefits, we’d suggest that this should not be the primary reason for joining and being active. We do encourage exploration of yet another great example of the Internet and the joys it can bring to folks.